There is a part of me that loooves challenge. Creative challenges that is. I love to try new things new approaches, new techniques, combine and join, mix and try out new -and old materials. My mind catches wings and I spend lots of nights (and days, and mornings…most of my waking time actually) imagining and planning designs when I find a new beading contest. 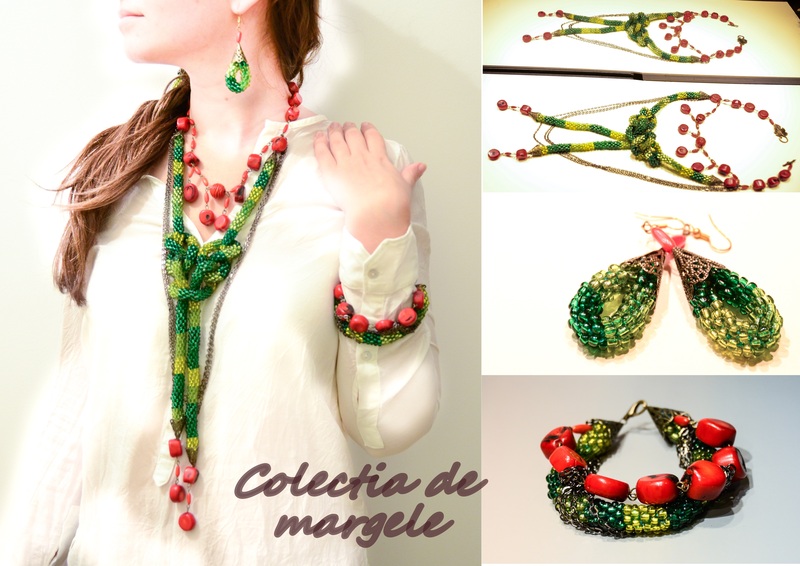 That’s what happened with the Coral Jewelry Contest posted in Loja pasionatilor de Margele group on Facebook. This is what my mind imagined for this lovely theme. When I think of coral, I think of the jewelry for kings and queens of old times, of pharaohs and goddesses. 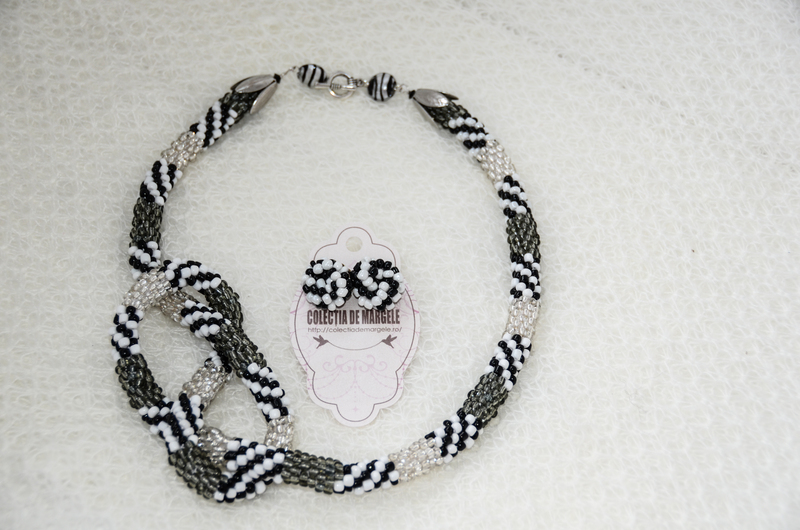 I think of coral, lapis lazouli and silver, of massive and impressive jewelry. Of golden sphinx masks with rich green and red adornments. So I thought why not make my own version of an ancient queen’s jewelry. Something old, something new… The old way, but with a new approach. A long to the waistline necklace with green to gold shades(old with the new interpretation) supported by coral (the old) and bronze, aged accessories. 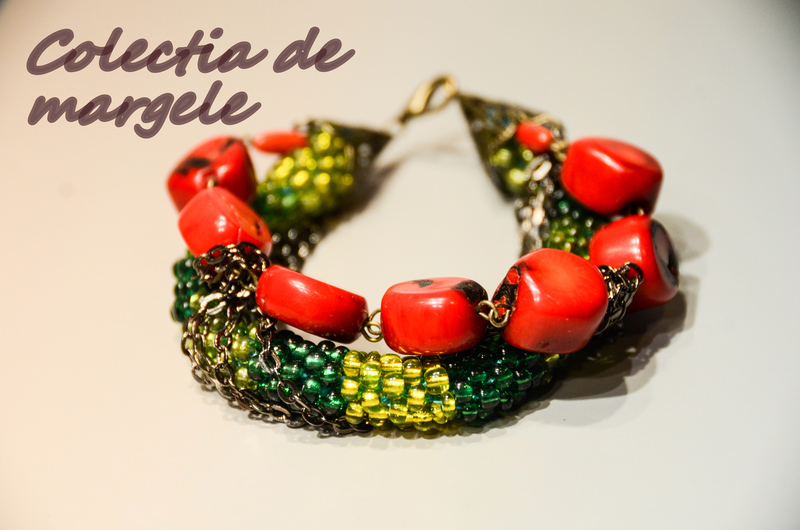 The bracelet: braided metal gun chain with green shades crochet beading rope and coral chain. Necklace: Two interconnected crochet beading ropes with a mystic knot in the middle, coral supporting chain with dangles, and a halo of metal gun chain. 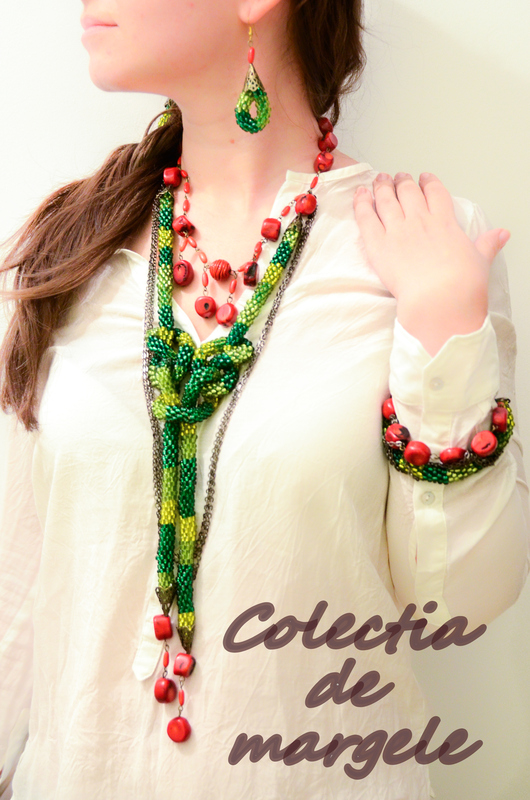 Earrings: green shades beaded crochet tube, bronze cone and coral. Hope you like it and it brings a little bit of magic and mystery in your day.